Today is Sinterklass Day in the Netherlands – but what is it? It’s Sinterklass day here in the Netherlands! Celebrated by many Dutch families (as well as by families in neighbouring countries such as Belgium, Luxembourg and Northern France), this tradition is observed instead of, or for some families in addition to, Christmas. Sinterklass is a Santa-like figure, which delivers gifts to good children and, according to legend, carries off the bad children to Spain in a burlap sack. 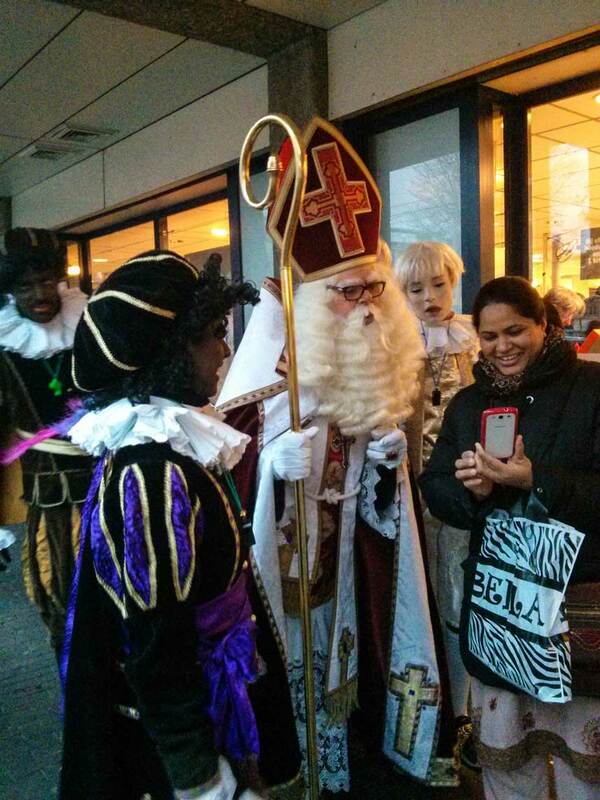 Sinterklass tours across the Netherlands before his delivery of gifts on December 5. In this picture, he is accompanied by Zwarte Piete and speaks to a lady who has taken his photograph. In the back is someone with a painted white face wearing a white wig, but I’m not sure if this is simply a white version of Zwarte Piete or another character. Any ideas? Sinterklass can usually be found accompanied by his helpers, the extremely controversial Zwarte Piete, or Black Pete in English. Zwarte Piete is traditionally portrayed by people with painted black faces, a curly black wig and dressed as a 17th-century page. Zwarte Piete was first depicted as a Moor, or black Muslim, in the 1850 book St. Nicholas and his servant by Jan Schenkman. 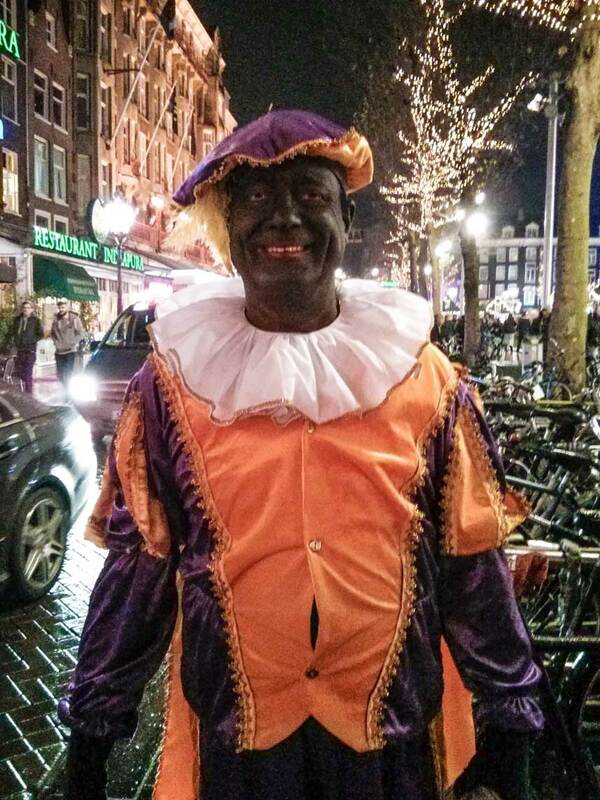 A Zwarte Piete poses in Amsterdam. Needless to say, Zwarte Piete is an increasingly controversial character in the Netherlands and abroad. Piete can increasingly be found with a rainbow coloured face, although many traditionalists are reluctant to change the portrayal of the character. I saw this in action when I attended the Sinterklass Parade on November 16, 2014. The parade marked the beginning of the season and saw Sinterklass and his helpers arrive in Amsterdam via boat from Spain. The group then paraded through the city handing out kruidnoten, or little ginger nut cookies, to the city’s very excited children. 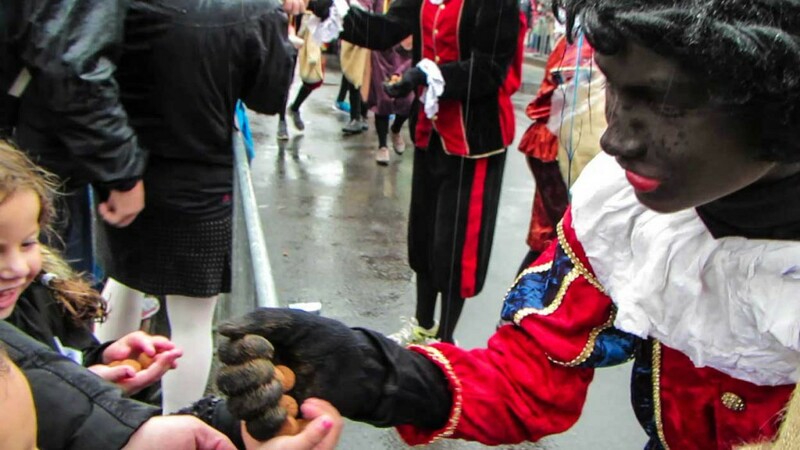 A Zwarte Piete hands out kruidnoten to children at the Sinterklass Parade. In the days after the parade, Sinterklass can be spotted making appearances throughout the country. ‘Sinterklaasavond’ (Sinterklaas evening) or ‘pakjesavond’(presents evening), is celebrated on December 5 when Sinterklass drops off a sack full of gifts and poems on the doorstep of children’s homes before heading back to Spain. Celebrations continue on December 6 with the opening of presents, reading of the poems, and with a family feast. Watch the video below to check out the Sinterklass Parade 2014 in Amsterdam!